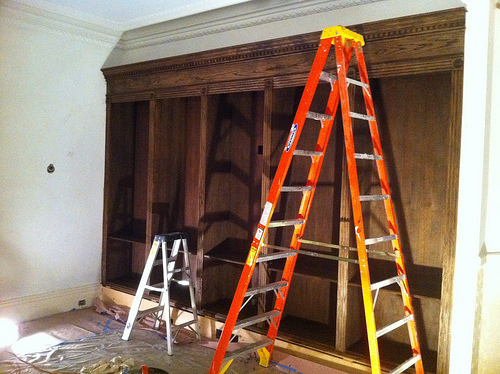 After five days of woodwork we finally stained the cabinetry today. 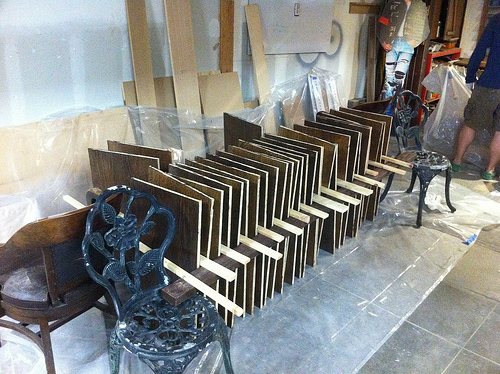 We also stained all 32 shelves and put a coat of sealer on them. We are using Minwax Jacobean stain which looks like a dark walnut. 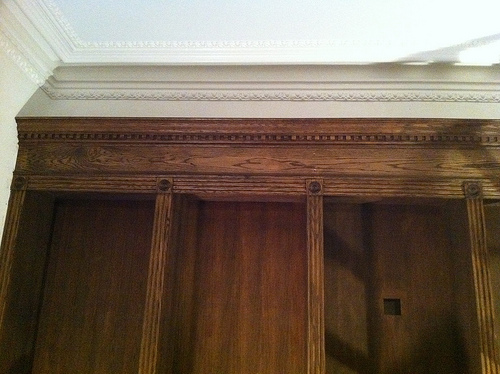 It matches quite nicely to the oak banister we built last summer as well as the fireplace in the attached parlor. I promise to take better pictures, not from my iPhone, when we’re done. Below you can see a makeshift rack I built out of spare wood we had from the project. Considering how many shelves we have and how many steps we have, a rack will allow us to do them all at once and let them dry. Other techniques involve using eye hooks to hang them from the ceiling but this seemed easier. I’m liking the two ladders in that pic. Putting the DuBoises to shame.